Oh no, it's the last day of our Geometric Challenge!! Bummer! I loved being in this challenge with this great talented group of women. Sad to see it end. 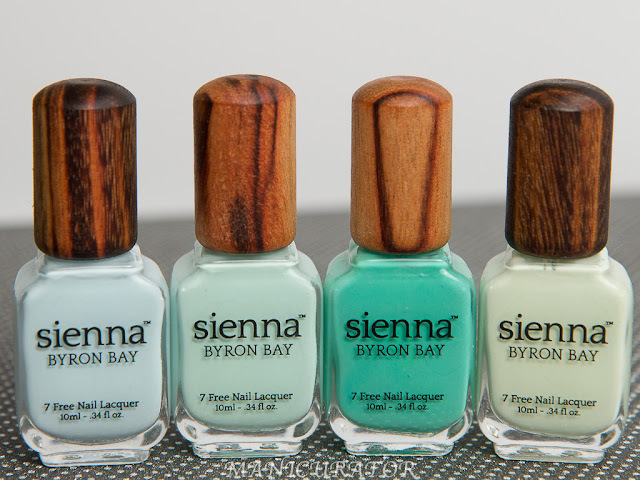 So, onto the mani. The theme for today is "recreate", so we pick someone else's manicure from the challenge to recreate. 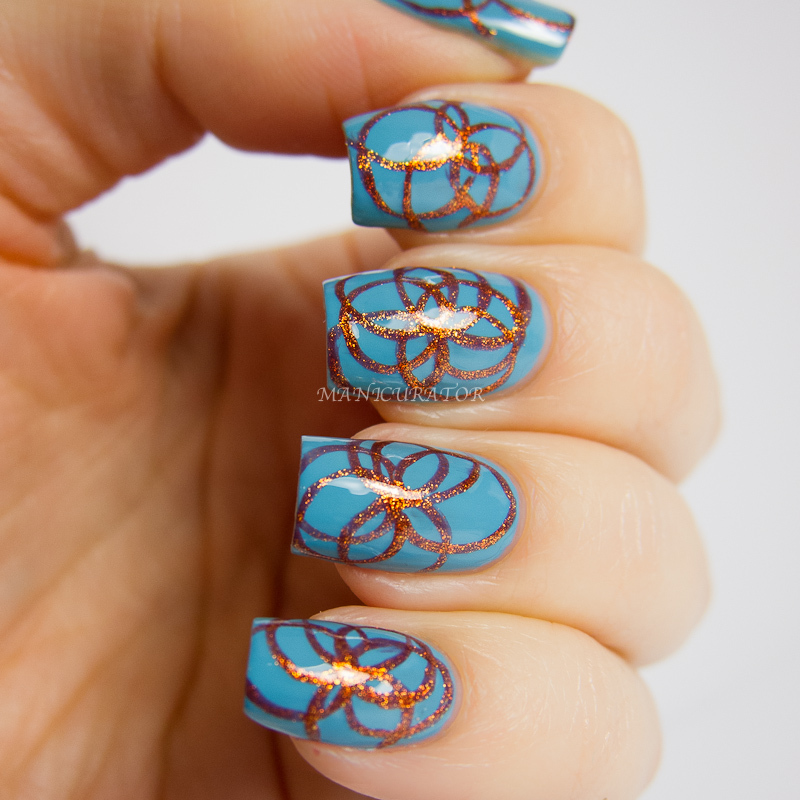 I chose Sincerely Stephanie's "round" nails from Day 2 seen here. I pretty much gasped when I first saw them, and KNEW I would make them one day. 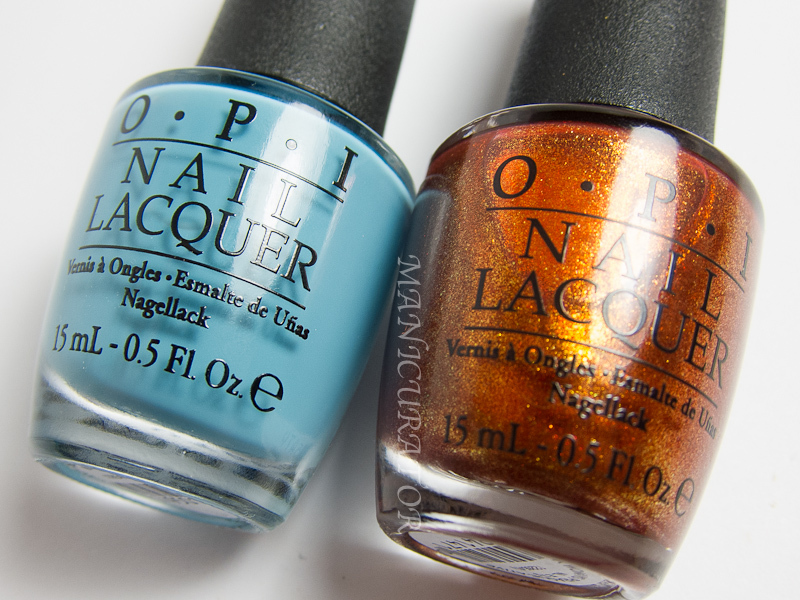 So today is that day :P I used two amazing gorgeous colors from OPI Euro Centrale Collection. 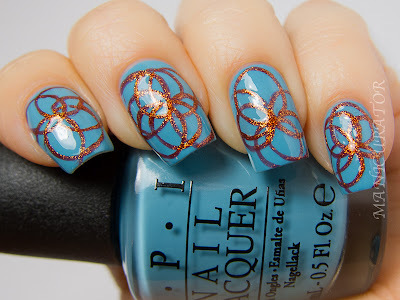 Euro Centrale by OPI will be available February 6, 2013, at Professional Salons, including Beauty Brands, Beauty First, Chatters, Dillard’s, JCPenney, Pure Beauty, Regis, Trade Secret, and ULTA, for $9.00 ($10.95 CAN) suggested retail for each Nail Lacquer. Visit www.opi.com. 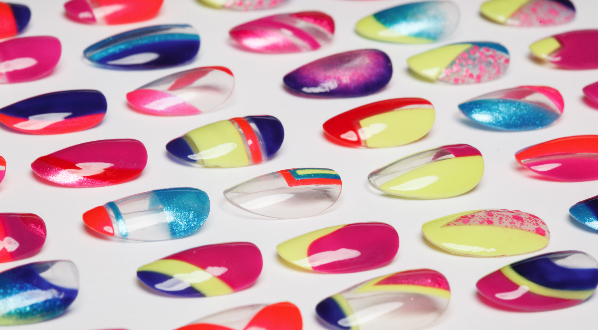 Follow OPI on Twitter @OPI_PRODUCTS and become a Facebook fan! Above is a shot before top coat went on. I have been liking the look of nail art before it gets top coated lately. Perhaps it's the texture trend ;) And below is with Seche Vite top coat. Can't Find My Czechbook is a great aqua blue that leans more blue than aqua (in my opinion). Great formula and complete coverage with 2 coats. I swatched all the blues from this collection back in November. You can see them here. 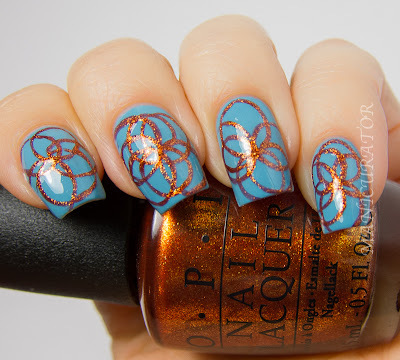 A Woman's Prague-ative is a gorgeous shimmery copper. 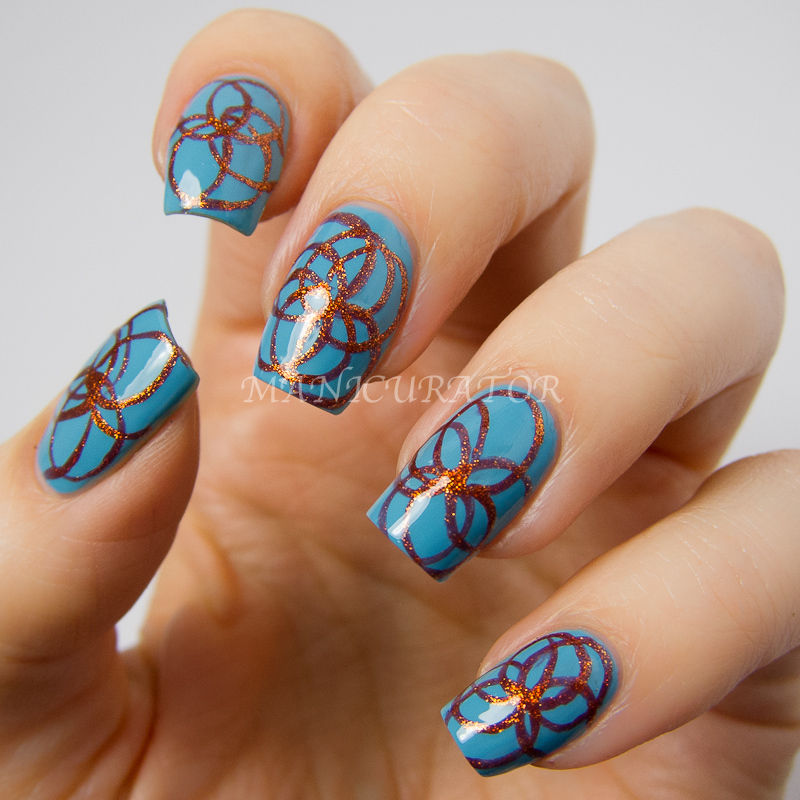 Great formula again and was really easy to work with for this nail art. Most circles are just one swipe with the nail art brush. I went over it a second time in some spots. 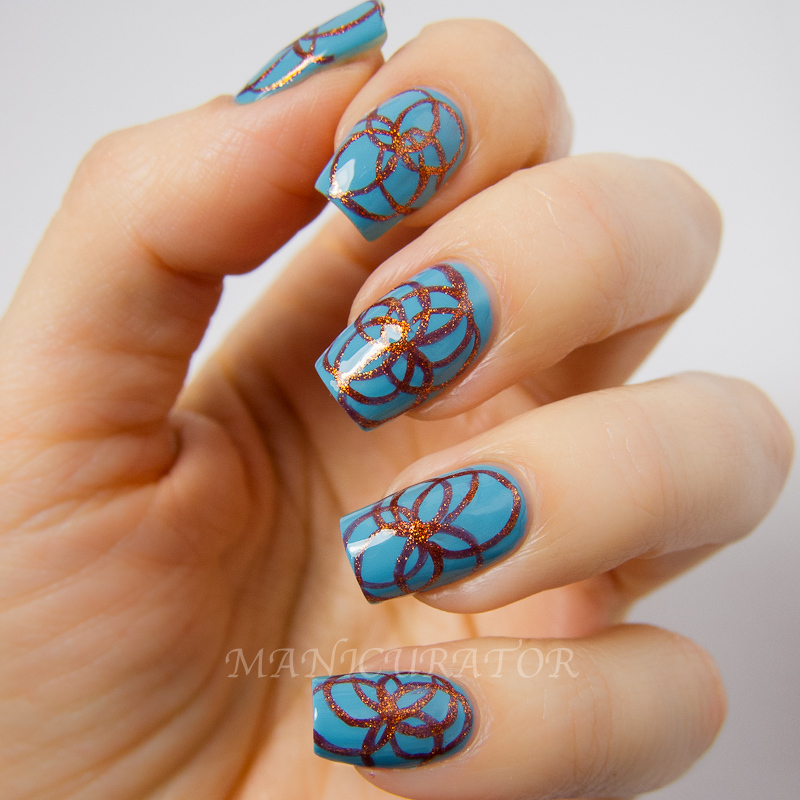 I used a thin nail art brush and simply free handed the circles on. I guess I'm getting better with my free hand! I never though in a million years I'd be able to make circles like this! 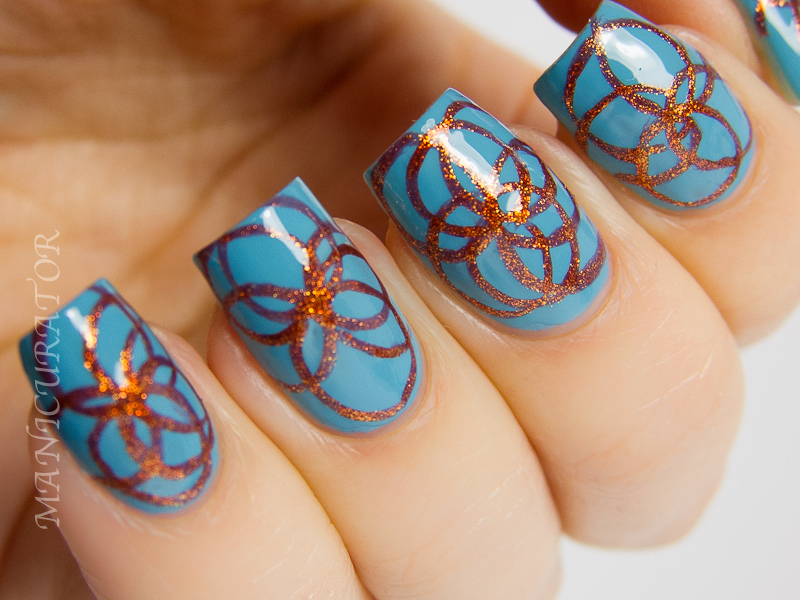 I absolutely love how this looks on the nail! Looks great! Love the colors together! Great job on this challenge, Victoria! Wow, this is perfect! Such a gorgeous mani! Free hand?! Are you kidding me?! I was going to ask what stamps you used! Gorgeous and perfect! Free hand? Are you a computer or something. Jeepers Creepers! wow! this looks so amazing! The circles are almost perfect! Great job! I love this. Wow, incredible. Sometimes, simple and bold is best! I can't believe you did those freehand. This is beautiful, love it! Those are simply amazing! I could never do that! Amazing! Love, love, love it! Holy cow, girl! I was sure that was stamped! Gorgeous and impressive!! OMG I just died! This is so amazing! Those colors are perfect for each other, and your freehand skills are on point! 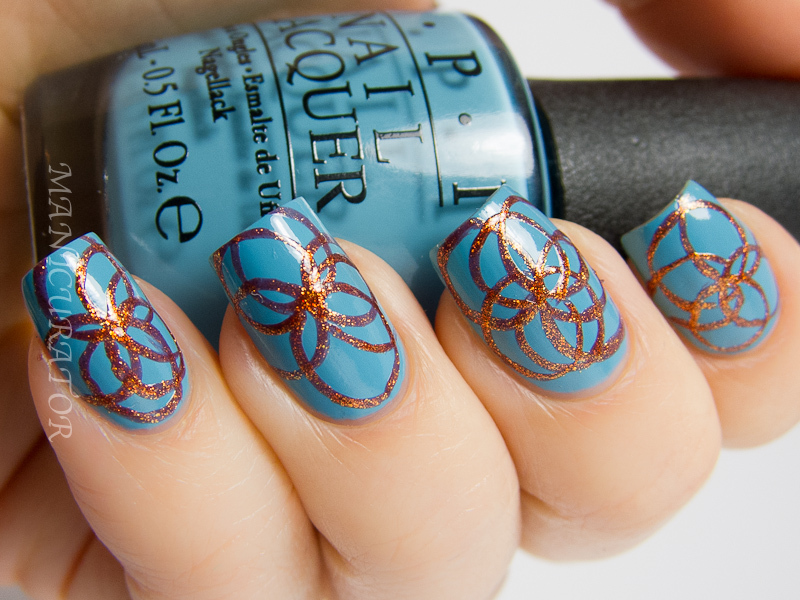 Ok, that's just ridiculous that you made those circles freehand. 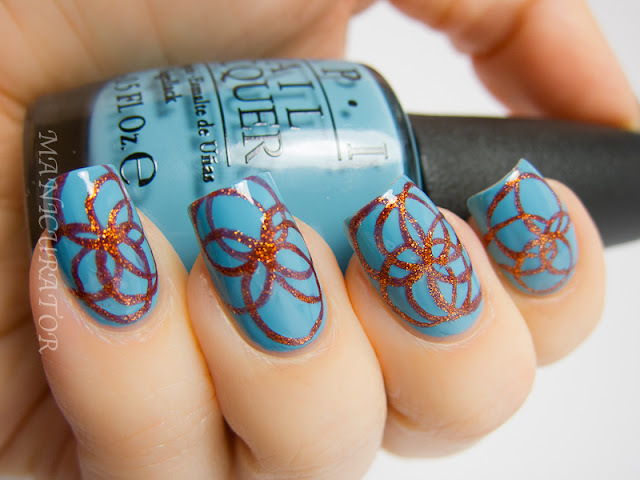 I love the color combinations too! Great job! NO WAY you free handed this!!! I just can't believe it-it's so awesome! Holy SH*T!!! Gorsh you're so good at it! I'm totally speechless. Besides this mani of yours is really tempting me to get a Woman's Pragu-ative. I just have to wait until my buy ban is over... hard. unbelievable!!!! come and do mine for me ?